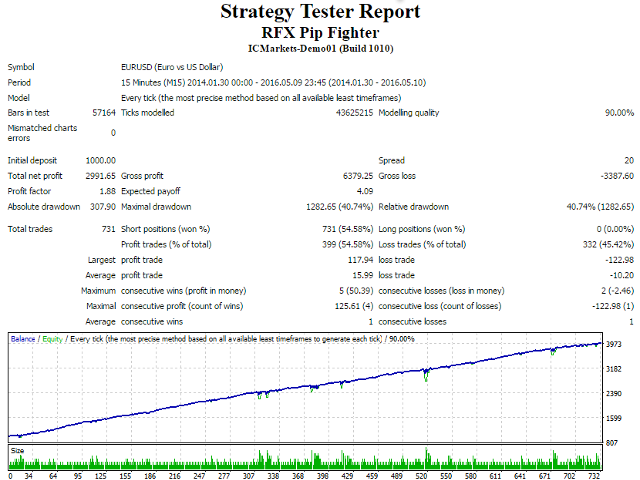 RFX pip fighter EA fights for gaining green pips. It implements an advanced adaptive grid strategy to make money. The strategy uses different indicators to detect and predict the market condition, trending or ranging, as well as the direction. According to the direction of the market and the predicted strength of the trend a grid of SELL/BUY positions will be opened and managed by an advanced algorithm to cancel out the most losing positions while keep the net profit positive. The EA adapts the size of grid to the current market condition in order to minimize the draw down while maximizes the probability of the win. Lot Size: Lot size of positions. This parameter must be a positive number. Target Profit (in money): The net profit (in the account currency) of the grid positions to close all of them. This parameter must be a positive number. Min Profit (in money): The minimum profit (in the account currency) to cancel out the most losing position. This parameter must be a positive number. Min Grid Size (in points): The minimum grid size in points. Fast MA Period: The period of the fast moving average. Fast MA Method: The method of the fast moving average. Fast MA Price: The price type of the fast moving average. Slow MA Period: The period of the slow moving average. Slow MA Method: The method of the slow moving average. Slow MA Price: The price type of the slow moving average. Sentiment MA Period: The period of the sentiment moving average. Sentiment MA Method: The method of the sentiment moving average. Sentiment MA Price: The price type of the sentiment moving average. Slippage (in points): The order slippage in points. Magic Number: The magic number of the EA. - In this version the EA opens positions based on user defined MA crosses. - Two filters added, Moving Average and ADX where the user has a full control on the input parameters.